Trust me! Spending some time to understand what KB theory is and what it can do for you will greatly expand your solubility capabilities. I will spare you most of the (dull) theory, and bring the capabilities to life with apps - some of which can take your experimental data and do the calculations for you! If you really want to "get" KB then you might want to take things more slowly in my Solubility Science book. Because the book is linked to the apps, you can try it both ways - book to apps or apps to book. As the book is free, there's no risk in trying it. Kirkwood-Buff (KB) theory is a molecular thermodynamics1 approach to solubility that is immensely powerful and assumption free. 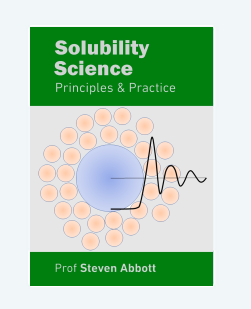 It is loved by the relatively small percentage of scientists who enjoy statistical thermodynamics and is generally unknown to those who simply want to understand solubility without getting lost in dry-as-dust thermodynamics that never seems to get to the point. The original KB paper is only 3 pages and when I first read it I couldn't understand a word of it. But those 3 pages, and the famous "inverse solution" from Ben-Naim have given us a tool of immense power - if only we get into the habit of using it routinely. As a recent convert to KB theory my aim is to convince those who are as afraid of thermodynamics as I was that it is worth the modest effort required to master its general principles. When it comes to doing KB calculations to get at the truth behind any solubility issue, the problem is not that they are hard, they are just nit-pickingly tedious and require lots of boring data (such as densities) that most of us cannot be bothered to gather. So another aim of this site is to allow users to do the relevant calculations as painlessly as possible with as little data as possible. But at the time of writing this first version, that is a long way off. In the meantime, have a play with the other KB apps. Who knows, you might start to enjoy molecular thermodynamics! 1Most people call KB "statistical thermodynamics". However, "molecular thermodynamics" seems to me to be a more meaningful term for those of us who are interested in using these ideas. "I'm using molecular thermodynamics" sounds more helpful in conversation with non-experts than "I'm using statistical thermodynamics".